EZEKIEL 36:26 KJV "A new heart also will I give you, and a new spirit will I put within you: and I will take away the stony..."
23And I will sanctify my great name, which was profaned among the heathen, which ye have profaned in the midst of them; and the heathen shall know that I am the LORD, saith the Lord GOD, when I shall be sanctified in you before their eyes. 24For I will take you from among the heathen, and gather you out of all countries, and will bring you into your own land. 25Then will I sprinkle clean water upon you, and ye shall be clean: from all your filthiness, and from all your idols, will I cleanse you. 26A new heart also will I give you, and a new spirit will I put within you: and I will take away the stony heart out of your flesh, and I will give you an heart of flesh. 27And I will put my spirit within you, and cause you to walk in my statutes, and ye shall keep my judgments, and do them. 28And ye shall dwell in the land that I gave to your fathers; and ye shall be my people, and I will be your God. 29I will also save you from all your uncleannesses: and I will call for the corn, and will increase it, and lay no famine upon you. A new heart also will I giue you, and a new spirit will I put within you, and I will take away the stonie heart out of your flesh, and I will giue you an heart of flesh. And I will give you a new heart and put a new spirit in you: I will take away the heart of stone from your flesh, and give you a heart of flesh. 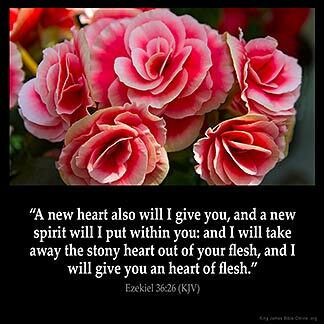 36:26 A new heart - A new frame of soul, a mind changed, from sinful to holy, from carnal to spiritual. A heart in which the law of God is written, #Jer 31:33|. A sanctified heart, in which the almighty grace of God is victorious, and turns it from all sin to God. A new spirit - A new, holy frame in the spirit of man; which is given to him, not wrought by his own power. The stony - The senseless unfeeling. Out of your flesh - Out of you. Of flesh - That is, quite of another temper, hearkening to God's law, trembling at his threats, moulded into a compliance with his whole will; to forbear, do, be, or suffer what God will, receiving the impress of God, as soft wax receives the impress of the seal. This is exactly how I feel, been feeling latley. I understand and see things for what they are. Negative things that didn 't bother me before now I find unjust. I feel happy, renewed kind of like how I use to be the old me but not quite. I have sinned so much last year at 23. I have distant myself from my friends because I know they aren 't on the same path I have just found. Im overwhelmed but grateful now that I can see. I look different even inpictures I have this glow or beauty but it 's shinning from inside. Very inspiring passage to me in my Christian walk. I appreciate the mercies of Christ that have transformed me from being a sinner to being forgiven. May he continue to grant me the will and ability to live a Christ like life.